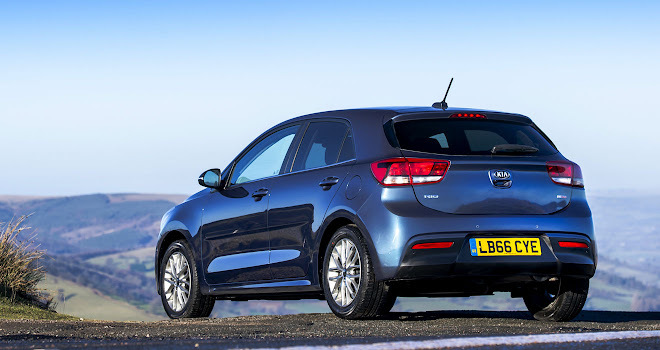 Kia’s latest Rio supermini, the model’s fourth incarnation, is a lot less wedge-shaped than its predecessor. Whereas the prior Rio had a lot of angry angles, this one is designed to look more calm and quietly confident. The change of demeanour mirrors prevailing trends in car design – a slanting shoulder line is so 2010 – but it also reflects a growing confidence from the South Korean brand. 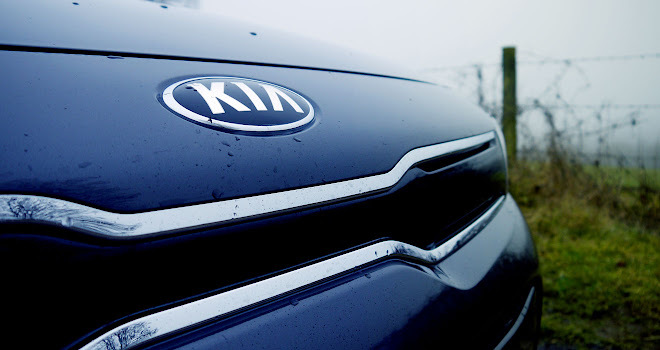 Kia is clearly intent on putting budget brand connotations behind it. Horizontal lines, a laid-back stance and subtle surfaces are all premium styling signals. The risk with quiet confidence is that it can all descend into blandness. Thankfully the new Rio’s face has a little more personality than its flanks. 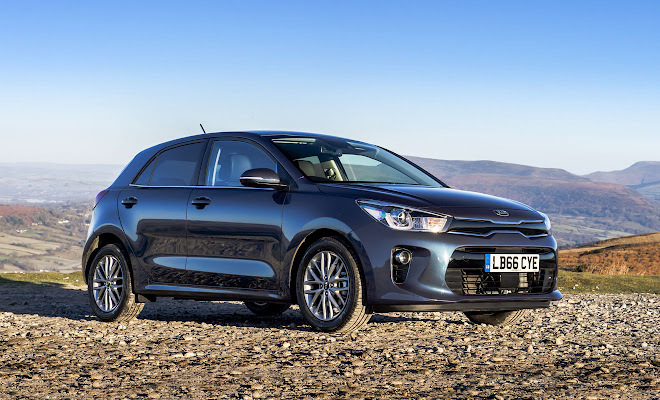 Kia’s signature pinched grille runs right out to the headlamps now, though it’s not actually a grille but a fairly flush slab of plastic. Air is scooped instead through the big chin inlet below the number plate. Inside, as outside, the new Rio seems both modern and reserved. The cabin has been thoughtfully laid out and well put together with few obvious signs of cost cutting. 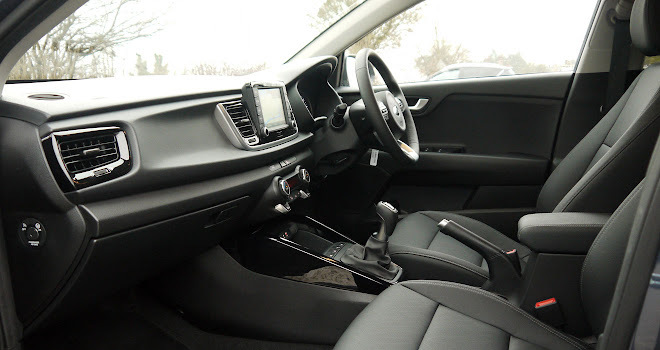 True, there is a swath of hard plastic across the top of the dash and across the doors, but it’s high quality, pleasant enough stuff as hard plastics go. A long horizontal scoop in the surface of the dash is designed to make the interior seem wider and more spacious than a tape measure might suggest, though the accommodation is not especially cramped in any case, for this class of car. 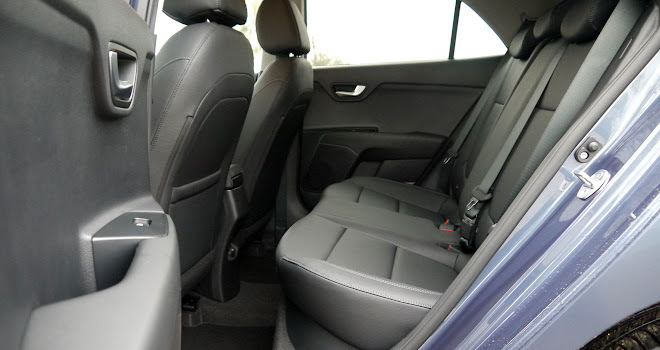 Rear seat legroom and headroom feel generous for a supermini, good enough for adults and ample for children. 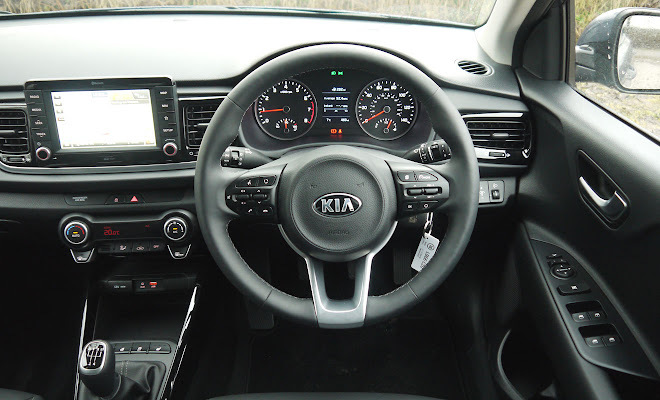 Trim levels are the usual Kia 1, 2 and 3, plus a fully equipped First Edition at the top of the tree. I sampled a pair of 3s, which arrived with bags of features including heated seats and a heated wheel for cold winter mornings. No heated mirrors, though, which might have been more useful. 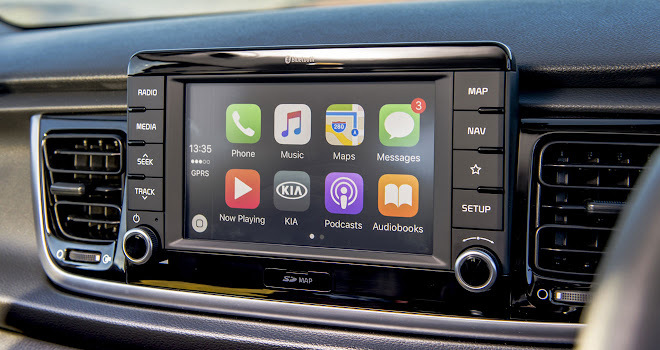 The top level Rio gets a seven-inch touchscreen that provides good contrast, responds promptly to prods and swipes and is generally very simple to get to grips with. Not every electronic system is always quite so obliging – the two Rios I tested both had dusk-sensing lamps that must have been calibrated by a carrot-eating cat. The lights were content to stay switched off despite a grey, foggy gloom that descended just beyond the end of the bonnet. There’s not much benefit to auto lights if you have to switch them on yourself. The auto wipers similarly came from the it’s-only-a-bit-of-drizzle school of not doing anything at all. I did hunt through the car’s setup options to see if I could boost their sensitivity, but if there is a means of adjustment I couldn’t find it. 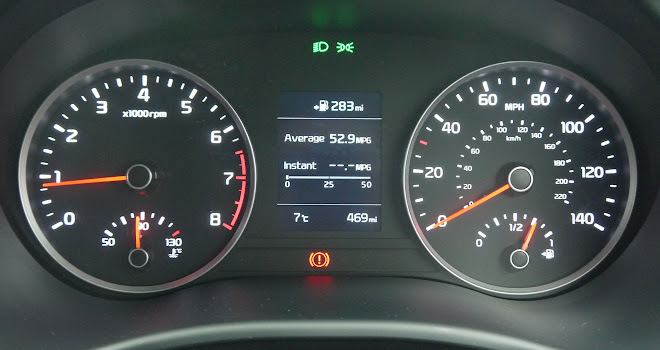 The little screen between the instrument dials does helpfully confirm which setting you’ve selected when you twist the stalks to control the lamps or wipers, however, so you can be sure that yes, the auto settings aren’t very impressive. I can only hope that the safety systems are more vigilant. These include the very welcome prospect of autonomous emergency braking, fitted as standard to grades 2 and above, or offered as a £350 option at the entry level. You also get a lane departure warning system at the same time, though this is always such a mixed blessing that I tend to turn it off. I was pretty impressed by the 1.4 CRDi Eco model, fitted with a four-cylinder diesel engine, paired with a six-speed manual gearbox. It provides up to 89bhp and 325Nm of grunt, and can propel the Rio to 60mph in 11.6 seconds. It enjoys a CO2 rating of 98g/km and, in the 3 trim tested, costs £17,245. I also drove the 1.0 T-GDi Eco, a petrol powered alternative with direct injection and a turbo, helping it to produce 99bhp from its 998cc, with 232Nm of torque. This engine is paired with just five gears in its manual box, and can reach 60mph in a slightly more swift 10.3 seconds. Other engines are available, not all of which are worth considering. Of the two I sampled, I’d choose the petrol option in a heartbeat, and not just because in the same 3 trim it’s £950 cheaper than the diesel, at £16,295. The petrol car is also lighter, and feels it, is generally nicer to drive and produces an appealing rorty sort of noise rather than a dull diesel drone when accelerating. Its CO2 rating is only marginally worse than the diesel’s at 102g/km, and I found a similarly close agreement in terms of real-world economy. Driving with a little care yielded almost 53mpg in the petrol powered Rio I tried and only 56mpg in the diesel. Your mileage might not resemble mine, of course. There are no driving modes to choose from, though the Rio’s instrument cluster does offer clear up and down shift reminders to help steer you towards the right option for economy. The hints weren’t terribly clever, though, at one point suggesting fifth halfway up a hill that really needed third, but they do serve to remind you to continually think about which gear you ought to be in. A start-stop system was fitted to both the diesel and petrol cars I tested and proved to be one of the better examples I’ve experienced. Restarts, prompted by depressing the clutch, seemed especially quick, quiet and seamless. Other driving impressions were reasonably pleasing if not particularly remarkable. The electrically assisted steering is light and accurate though quite lacking in any kind of feel. Both the five and six speed manual gearboxes I sampled were neatly free of any rubbery vagueness, and the evenly weighted, predictable clutch and brake should flatter even a ham-footed L-plate driver. 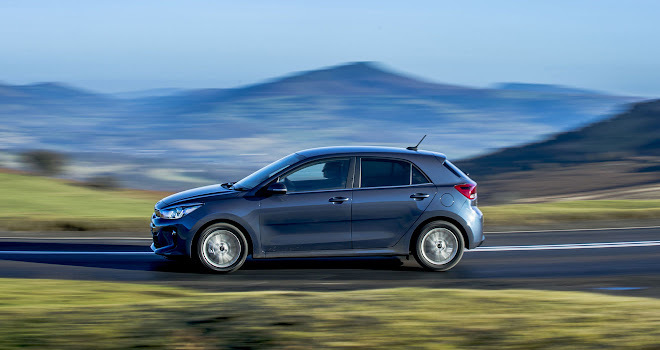 The Rio is not a sporty car, but it is both quiet and stable at speed, with suspension geared towards smooth riding over bumps and craters rather than tenacious or spirited cornering. As I noted at the start, the new Rio comes with a marked change in demeanour compared to its more eager-looking predecessor (and in stark contrast to many of its more sporty looking rivals, too). It’s clearly aiming to deliver a refined, grown-up, satisfying feel, to go with its sensible seven-year warranty. In those terms, at least, it does a pretty good job.